I wish to start up a Hedgehog Rescue in my area, Littlehampton in West Sussex. I don't think any rescue of such has been set-up in our area. Me and my nan wish to set this up and run it. Re: Want to start a Hedgehog Rescue... help please! 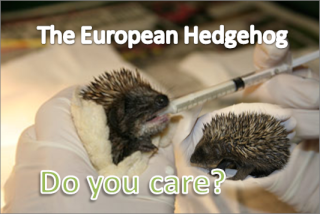 welcome to this forum, first thing you will want to do is to get in touch with the BHPS at http://www.britishhedgehogs.org.uk/FAQS/faqhome.htm and let them know you want to become a hog carer and they will send you a carers imformation pack. and if you are lucky a heat pad. There is also a good book you can get called Hedgehog Rehabilitation by Kay Bullen VN, this is a very good to have. If you go to my website at http://rons-hedgehogs.webs.com/index.htm this will show how I do it and some of the babies I have in my care at the moment, and also read the questions and answers on this forum and you will lean quite abit from here. Thank you so much. We'll get in contact with them. More organisations to deal with Hedgehogs I guess, the better for the small cuties. Awh, they are soo cute. Yes, Jake, I'm sure this will go far. Will look forward to setting up the website with you and hearing about how things go. Bethany wrote: Yes, Jake, I'm sure this will go far. Ron, that video of the little Hedgehog being fed is very cute indeed! Thanks for sharing. Good luck with your hedgehog rescue. I'm sure you'll do a great job, just need some research done and it'll be fine. I'll receiving on-going support from Bethany. Trish wrote: I wish you all the very best!! Thank you so much, it's given me a few ideas on regards to my 'rescue site'.